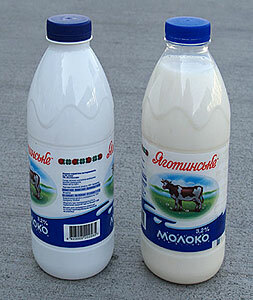 Two complete lines for filling of milk, yoghurt, kefir and cream. 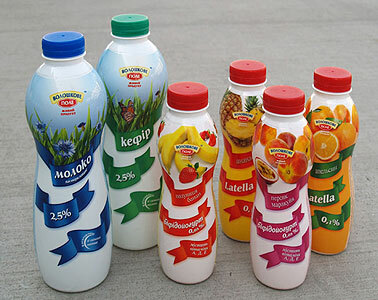 Two complete lines for filling of milk, yoghurt, kefir and cream were delivered, installed and put into regular operation in Ukraine. One of the lines is installed in “Jagotinski” factory and the other one in ZAO “URIA” in Cherkasy city. ZAO “URIA” uses glass and PET bottles and thus the choice was the filling tribloc IND-Dose 49 RRWTC 24D/18/6 Pragmatic® in edition with two cap orientators and double Pick & Place with automatic interchanging when the cap is changed from the metal Twist Off 43 for the glass bottles to the HDPE screw caps for the PET bottles. This allows for very fast adjustment for work with different containers. The line capacity is 6000 bph for 1 liter milk and 8 000 bph for 500 ml yoghurt. The Multibloc is in UltraClean ESL 30 edition and is designed for products with shelf life of up to 30 days. In “Jagotinski” factory only PET bottles are used and the filling line comprises a Tribloc system IND-Dose 49 RRWTC 32D/24/8 Pragmatic® in Neck Handling edition, which practically eliminates bottle changeover time. The factory fills 1.0 l, 0.5 l, 0.33 l, and 0.25 l bottles. This Multibloc is also in Ultra Clean ESL 30 edition. Line capacity is 10 000 bph.